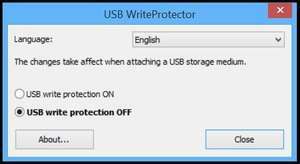 USB WriteProtector is a completely free tool which offers some additional protection for your data and can provide write protection to devices connected to your PC. There are numerous reasons to use a program like this with the most likely being the ability to protect against undetected malware. If you have important data on a USB device, this program can be really helpful. You can use USB WriteProtector to either turn on or turn off write protection. Version 1.2.0.0 is a freeware program which does not have restrictions and it's free so it doesn't cost anything. For security reasons, you should also check out the USB WriteProtector download at LO4D.com which includes virus and malware tests. Additional screenshots of this application download may be available, too.